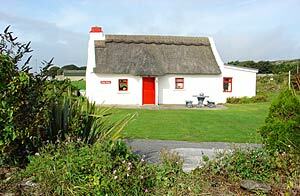 Kiely's Cottage is a small, quaint, traditional thatched cottage in a unique location about 100 yards from The Curragh beach and enjoying sea views. 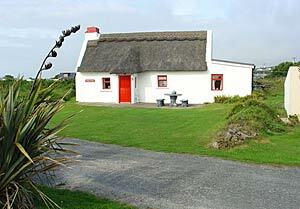 This is a pre – famine fisherman’s cottage built in the year 1840 which has been completely renovated and it is listed as a Protected Heritage Cottage in Co. Waterford. Well furnished and equipped, small kitchen / sitting room with multi fuel stove, 2 bedrooms - main bedroom with double bed and 1 small room with bunk beds (access to the small bedroom and the bathroom is through the main bedroom). Radio, T.V, DVD, washing machine, electric storage heating. The historic fishing village of Ardmore (listed in the top 10 most attractive villages in Ireland), is 3km away by road and is only a 15 minute walk across the main Ardmore beach. It has the award winning '5 star Cliff House Hotel', restaurants, pubs, Quinn’s supermarket and Ardmore Water Sports Centre. Local attractions include a 5km Spectacular Cliff walk, giving breath-taking views of the Cliffs and Atlantic Ocean, St Declan’s Monastery - Irelands first Christian settlement founded by St Declan in 416AD before the arrival of the St Patrick in 432AD and alongside is a very impressive 12th century Round Tower (29m) situated in a beautiful elevated position overlooking Ardmore Bay. Dungarvan (25 km), Youghal (14 km) and close to Lismore Castle/Gardens and Heritage Centre, the Ring Gaeltacht/Helvic Head, Blackwater River Valley, and 'Dromana Gate' the Hindu - Gothic gate lodge near Villierstown built in the 19th century. Waterford City (70 km), home of Waterford Glass and Crystal with guided tours of their Factory and their Visitor Centre is an opportunity to choose from the world’s largest selection of magnificent Waterford glass. 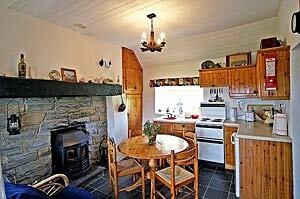 Available for self-catering on a weekly basis - Saturday to Saturday. 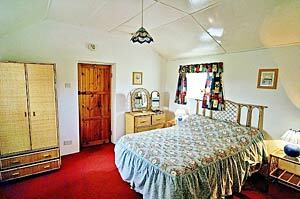 Mid week or weekends - depending on availability.